Monday November 11th 1878 It was still gloomy this morning. I did a large washing and put the clothes in the garret. 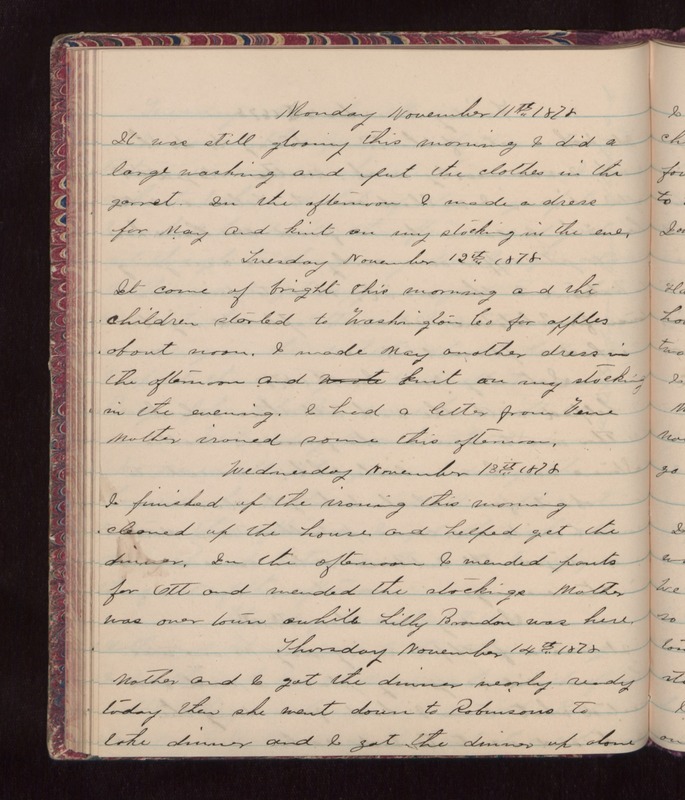 In the afternoon I made a dress for May and knit on my stocking in the even.Tuesday November 12th 1878 It came of bright this morning and the children started to Washington Co for apples about non. I made May another dress in the afternoon and knit on my stocking in the evening. I had a letter from Vene. Mother ironed some this afternoon. Wednesday November 13th 1878 I finished up the ironing this morning. Cleaned up the house and helped get the dinner. In the afternoon I mended pants for Ott and mended the stockings. Mother was over town awhile. Lilly Brandon was here. Thursday November 14th 1878 Mother and I got the dinner nearly ready today then she went down to Robinsons to take dinner and I got the dinner up alone.